San Francisco voters Tuesday gave a solid thumbs-up to Proposition C, which is designed to inject the most money ever directed at city homeless programs by taxing big businesses to raise hundreds of millions of dollars. With 99 percent of the vote counted, the measure won 60 percent to 40 percent — a solid majority, but one that might not be big enough to avoid legal entanglements tying up or even eliminating the funding the proposition aims to to raise. The measure was easily the most contentious on the city ballot, dividing political leaders and pitting the Chamber of Commerce and the owner of tech giant Twitter against nonprofit programs and the owner of the city’s largest private employer, Salesforce. It will charge corporations with revenue above $50 million about 0.5 percent in gross receipts tax, with the proceeds going entirely toward homeless programs. Budget analysts estimate it will raise between $250 million and $300 million a year — nearly doubling the amount already being spent on homeless services and housing. Prop. C, also referred to as the “Our City, Our Home” initiative, needed one vote over 50 percent to pass, but proponents were hoping for two-thirds to avoid legal challenges from those who believe anything less might violate state law. Some form of that challenge now seems nearly inevitable, delaying the implementation for months or years. He said that despite not meeting two-thirds vote, the city should press full speed ahead, and that he will lend the full capabilities of his legal team to help that happen. Homelessness has long been considered San Francisco’s No. 1 problem, driving away tourists and mortifying residents with the daily spectacle of ranting mentally ill people, addled addicts and tent camps. So there was little disagreement at the idea that more funding could help. The heated debate was about how much money that should be, how it would be spent and monitored, and whether dipping a new hand into business pockets would drive away jobs and damage the city’s burgeoning economy. The highest-profile battle over the initiative kicked off when billionaire Benioff and his company pitched in their funding and challenged other business leaders to join them. Jack Dorsey, head of Square and Twitter, fired back on — yes, Twitter — that the tax would be unfair, tamp down growth in the city and wasn’t thought out well enough. Jennifer Friedenbach, executive director of the San Francisco Coalition on Homelessness and a principal architect of Prop. C, said the argument that the plan wasn’t detailed enough didn’t hold water. “It’s a comprehensive plan that’s been carefully thought through,” she said. Opponents said they were confident a legal challenge now making its way through the courts to similar 50-plus-one percent votes, including a June San Francisco measure to boost teacher salaries, will delay if not outright kill Prop. C by setting a new negative precedent. Meanwhile, it is probable that the tax will be collected and merely banked — not spent — while the legalities are worked out. That could result in a whopping pot of built-up cash that becomes suddenly available down the line if the challenge takes one or two years. 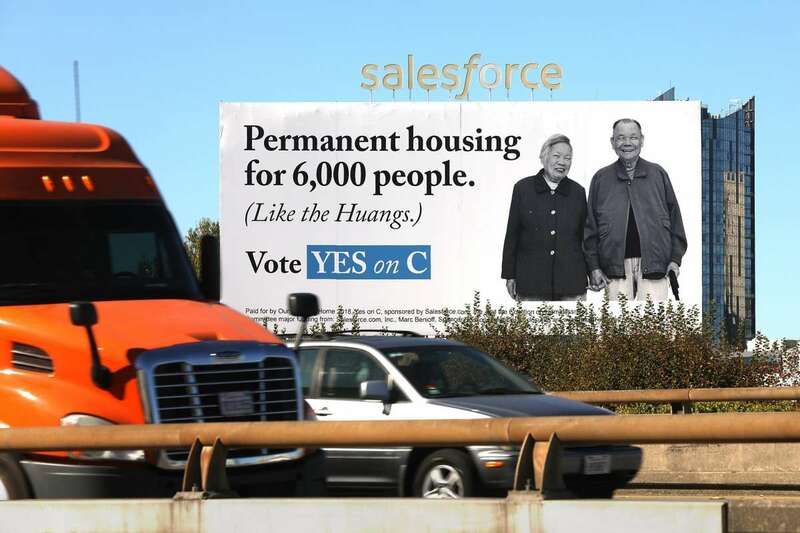 “Despite an unprecedented, all-out $10 million campaign, the Yes on C campaign failed to earn two-thirds support, and as a result San Francisco stands to never see a penny for what Prop. C promised,” said Jess Montejano, spokesman for the No on C campaign, which was led by the San Francisco Chamber of Commerce. He said opponents would work with Mayor London Breed, who also opposed the measure — for other solutions to the homelessness crisis. The city’s chief economist estimated that the tax’s impact on the economy and the job market would be “small,” costing the city as many as 875 jobs over the next two decades. Prop. C mandated that at least half of the $300 million be spent on permanent housing for homeless people. About 25 percent was blocked out for mental health services, up to 15 percent for services to help those who recently became homeless or are at risk of becoming so, and up to 10 percent for emergency shelter and hygiene programs. Proponents said the new money can create housing for at least 5,000 people and 1,000 new emergency shelter beds. As many as 400 companies, making up 15 to 20 percent of the city’s job base, will be subject to the new tax. The city’s chief economist estimated that the tax’s impact on the economy and the job market would be “small,” costing the city as many as 875 jobs over the next two decades. The analysis could not project, however, the difficult math of how much business and employment might be generated by a reduction in the vexing homeless problem — something proponents said would happen.